please enjoy your healing session ALLOWING! Here the exact time we will be performing the energy healing for you to convert into your time zone. We are wishing you an uplifting experience and would love to hear from you after session. Here in this thread we will post our first impression, group report and respond to personal inquiries. Thank you all for participating in this somewhat complex but also at times, very beautiful session! Many of us teetered on the fine line between control and Trust, where everything begins to open to allow change. You may have felt this as fluctuation between tightness and opening of the root chakra. Trust brings the sense of security and knowing that all will be well. I'm sure you understand. Responsibility for ourselves as well, needed some attention. We all have to claim our own intent and choices if we are to move forward...there are no fixers in this world...we move forward when we decide it's time. Ask for Courage as needed...reaffirm you are in your heart and take a step. One small one is perfect for this moment! Much of the group would benefit as well, from pulling back to center...into this moment and be with Gratitude and Appreciation for anything you can think of, no matter how insignificant to the mind. We are guided from within to be with this experience as fully as possible, even the times that may feel uncomfortable. Nature was with us for much of the session...if you are drawn to it and find it comforting or clearing, try to spend some time there as soon as you can. Remember there is much to appreciate if we allow our awareness to show us. Make sure to drink plenty of water in the next several days and don't be surprised if things continue to unfold for you, in dreams, unexpected emotions, etc. Jona will be writing a more in-depth report for the session. In the meantime, please share if you feel drawn. We appreciate your interaction! I said the invocation and listened to 'Allowing' , I noticed that my mind was restless giving me a list of things that I want and need to get done. Before the transmission I had a bath in order to be relaxed and unwind my mind so that it was relaxed but I guess it didn't work 😂😂. I haven't been around here for a while as Ive been focusing on a specific meditation technique and trying to ground and integrate stuff I learned last year. But this session was great timing considering the pain I had in my tailbone and well to be honest...the pain from not being able to poop properly which has been another thing entirely. I never knew it could be so bad!!! It turns out not being able to poop is NOT an option. Anyway the buzzing energy came to me a whole day before the session started and the pain subsided too, and reading Rogers comments yes its been a real root chakra clearing day, in and out of the bathroom which is good. Trying to drink lots of water as Ive been dizzy and heady too. It was an amazing session for me... despite only staying conscious long enough to wake up and read the invocation before falling back to sleep. However, I do remember feeling the beautiful buzz and then a distinct critical voice off to the right side of my head. It felt completely separate from me and somehow evaporated. Dont know if I booted it out myself or it got zapped in the Prayer Field but it showed me something so obvious that I never felt before...the difference between the "low vibe critic me" and the "true self me" was incredible. A new reference point. Wow! Some grief came up last night from old romantic wounds but also Ive been processing deep trauma lately so while I know some of my issues are due to medication theres been another level going on with my tailbone. Im kinda getting the hang of feeling out or even replaying trauma in meditation then asking the Divine to send its light in and help me release it so Im not stuck in it. Revisiting issues with a higher power on board then saying "OK been there done that, time to move on". Thanks for the comments Roger, Ive been getting related things come up lately about the need to make a conscious choice to move forward while trying to stay in my center (which I still find a challenge). And Gratitude feels like a high flying vibe a the mo, been getting that a lot. After I woke later in the morning and re-read the invocation I got a clear message "what you focus on is what you energise". Cool. Much love to all and thanks to Jona, Roger and the Prayer Group. Its great to be here again! What a transmission. First a thought that I can't write my experiences, that it's too embarrassing - but ok now I do it anyway. It was a very difficult Transmission. I have been sick the past week, I have worked with The Shadow the last 14 days and it has been a bit intense. My physical health teased me. I cough so I have difficulty breathing and nearly been panicking several times. It was very hard to be focused on contact with the heartcenter and my mind was very active and disruptive throughout the transmission. Even though I tried to focus on Allowing and Trust, it didn't work. I thought for the first time to stop in the middle of the transmission. However, I was convinced that I should stay and look at it. What a lot of resistance was activated. Anyway, thank you to Jona, Roger and the co-facilitators to making the field safe. Thank you for this experience, I felt supported and safe to go deep. I experienced a shift around the idea of 'putting myself first', formerly I experienced that as a belief that to put myself first I needed to protect myself and to do that I was often using the state of 'victim' as a shield. What is clear now is that putting myself first, loving myself, is about loving and allowing my True Self, the Divine, to come forward (my mind and ego stepping out of the way). I needed to learn to trust myself, my True Self and I thank you for supporting me to experience that during this session. Lots of other stuff came through around help and needing to be needed (also associated with victim state) and how that has influence the manifestation of my current life state and relationships. Very powerful insights and shifts. Thank you all for joining this really insightful session. then acknowledged, accepted and surrendered to Divine Love within us. Love that can abundantly flow through us and is our given birth right. A part of our session was resistance, be it resistance to resistance that also needed to be allowed or repressed thoughts and feelings that wanted to come forward (which they did for some of us) that we do not want to face or are not ready just yet. Even the form of 'stuckness' needs to be allowed and felt as in this we can be more honest with ourselves and it connects us with our present moment and where we are at – which is far more beneficial for us than some imaginary idealized illusion of ourselves projected into the future. The interesting part was also that through our collective implants we do not allow or don't know how to feel our emotions and feelings and if we are repressing any of them chances are that we are repressing or resist love and greatness within us as well. Anyway, in our session what was also observed was that some of us were on a verge between pride and courage , false self and true self. Sessions as of late (or possibly always) remind of constant surrender and allowing Divine to show us the way out of limiting beliefs and skewed views of ego perception. Lets be a bit more courageous for our True Selves no matter how small the act of courage may seem to the ego in the I of Divine its simply an act of Courage. Thank you all for your patience! I will be getting started over the weekend with replies. Thank you all for sharing and posts are still quite welcome. Thank you for sharing! Perhaps a bit of perspective shift might be helpful. The mind is an amazing instrument and absolutely necessary for this experience. Without it, we would likely not be in body for as long as needed. It is also an aspect of us, meaning that when we look from a point of Self-Love, it cannot be seen as separate…Self-Love, True Love, Unconditional Love, doesn’t make a list of aspects to include or not. The mind has its purpose but we need to see it as something that will be controlled only through the choices we make as to what we will align to. If we maintain positive outlook and reinforce that through choice of thought, the positive will eventually outweigh the negative. Allowing is a key here also. Most of our thoughts, if we pay attention or even note them, are repetitious and of very little use….many not even our own, just picked up drifting through the collective. Once we are aware of this and come to realization they have little meaning or power, especially relative to the Divine Love in our hearts, we begin to learn how to ALLOW them just to drift through our field or awareness without giving them significance. I sometimes imagine them as a butterfly coming into our vision and just passing by. Perhaps we can get a moment of pleasure for the colors and lightness of flight but then we let go. We run into inner turmoil or conflict when we try to control or fight the mind…it is not likely a fight to be won. SURRENDER and ALLOW. It does well when it simply rides along on a shoulder…not driving. Turmoil also comes from our expectations on how we think things should be. What if during next session, or practice with the ALLOWING recording, you went into the experience without any? There are no rules or requirements as to how the sessions should be experienced. If you do fall asleep, you may miss a visual or two, or insights that the mind would pick up on but as mentioned before, the mind often gets in the way and in itself is a form of resistance so the field energies often assist us in falling asleep so that we (your Higher Self) can go into deeper levels of the work. You may find some benefit with learning more about critical inner voice. There’s a good book for that which Jona often recommends, titled “Conquer Your Critical Inner Voice” by Robert W. Firestone, Ph.D, Lisa Firestone, Ph.d., and Joyce Catlett, M.A. Lots of cool info in there. It might help also, to write the thoughts down and review. Are there items that repeat, things perhaps that require change or action? Are some worries or frustrations about things you cannot control perhaps? We can ask, like in a popular prayer, our Higher Selves, Divine, or Inner Higher Power for the Serenity to Accept those things. Then we simply Trust that it will be done, and Let Go. Hello Jona, Gosia and Roger and remote prayers group. I missed the first 20 mins of this session as I fell back to sleep after my alarm went off, then I only managed to stay awake for the invocation and a few more minutes. while I was awake I noticed a pain in my mid back, behind solar plexus and I had a bit of a tingle/cough in my throat. Much gratitude and appreciation for this transmission. Good you’ve been working on grounding and integration, both were noted and you may find benefit in continued practice with grounding, maybe add other methods or increased frequency as some need is still shown. Part of the integration was to assist in bringing the physical body into the spiritual journey. There can be some disconnect there at times as the body may prefer to remain with what’s been known and comfortable and can lag behind in change due to being more dense. Very cool on the critic and True Self clarity! Definitely quite an energetic difference and a great way to experience them, side by side for real time comparison. Sometimes as we move forward through the work we do, these memories can fade. Imagine if clarity remained, how quickly we could align to gratitude for the changes. The practice you’re doing with turning things over to Higher Power is perfect right now. Keep going with that and you may find it helpful to ask for assistance in allowing even deeper levels of LETTING GO and SURRENDER. This can assist us in further shifting to a higher perspective or bigger picture if you will and increase TRUST that all is as it should be. The result is greater Divine/Source/Inner Higher Power energy flow from within us. Unconditionality, Acceptance, True love etc…just some of the energies that bring us back into balance and support the body in its own healing. The more of this work we do, the easier the moving forward can become as we develop very deep TRUST in Divine/Inner Higher Power/Source and come to realize that it is that which we are and nothing can bring harm to that which is Infinite and Eternal. It can take Courage for some time though as the ego needs to be convinced that it will be ok regardless of our experience. The fear that comes up is often the ego terrified of its own end and not so much ours. Practice, practice, practice… Your comment about focus applies here. Focus on Trust in Higher Power will reinforce our alignment to that energy and this then, allows for the Courage to step forward. If not already, you may want to also look into some form of support group for your current experience. There was some sense of being alone now but in Truth, none of us are alone or in unique circumstances. It’s often not the way the mind sees it though. Thank you for sharing! I would ask the question, "Was there not ALLOWING and TRUST in the choices made to stay in the session and share? 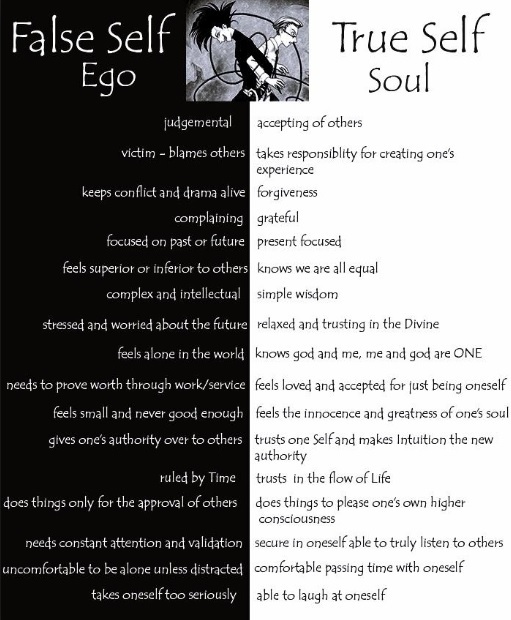 ", both of which put you face to face with ego. This is what we're here for. We might share some laughs one day...I've personally backed out of a session or two after a couple years into this work when the ego could not handle what it was facing. I hope you're feeling better, our energy can be drained with illness and find it more challenging to deal with many things. Thank you for participating and sharing! Very cool insights in your experience. It’s not unusual to use victim for protection in that there is a perspective that if something outside of us has done harm, worn us down, (maybe through what might be perceived as personal sacrifice, which is sometimes glorified, but of no benefit) or inflicted pain, there is a deservingness then to take care of ourselves. For many of us, our feeling that we are unworthy doesn’t allow Self-care without guilt. Yes, loving ourselves is about ALLOWING the DIVINE LOVE that has always been within us to be consciously with us again in this experience. It’s never went anywhere, we’ve simply covered and hidden it away so it’s a matter of LETTING GO those things or stories through which we’ve developed the barriers or clouds between us and our hearts. In eyes of Divine, our worthiness is not even a question as it is UNCONDITIONAL LOVE….there is room for nothing else within that. You were working on supporting yourself around Congruence, meaning bringing harmony between inner and outer experience/beliefs and can sometimes bring a bit of pain. This also typically involves empowerment toward developing healthier boundaries and courage to speak ones own Truth. Needing to be needed is very familiar and common indication of co-dependent tendencies. You’ll have to feel that out for yourself but It might be quite helpful, if you have not, to learn more about it and perhaps even try out some Codependents Anonymous meetings or something similar. At the core of course, is the perceived missing Self-Love which we learn to seek in others. I would also like to extend an invitation to contact Jona as one of the transCOACHES felt connection, perhaps through recognition of similar life experience, and has offered a complimentary coaching session if you might be interested. As is often the case when we share our experience, strength and hope with another, there could well be mutual benefit in the experience. It feels as if you’re in a perfect place at the moment to build some momentum in moving forward so I really encourage you to keep going! Thanks again! Thanks for your excellent feedback Roger, really helpful stuff. Awesome. Been feeling the effects of the Prayer Group all week, had a distinct shift in perspective and it helped move me into a state of greater acceptance. I did get tangled up in old patterns and spun out quite badly this weekend which was a brilliant reminder on how it takes practice to stay grounded. Thanks to Gosia too..whose original report triggers off a great sense of peace in me. Thank you so much for your feedback which is very helpful to me. And nice with a place like Forum where you can tell/ask/discuss all there is. You will have to feel it out but perhaps the back pain might be tension related as in trying to control or hold things in. There was some imbalance, as in tendency toward thinking over feeling so shifting focus more to what you’re feeling may help you get in touch with what might need some attention. Practice with the recording could help as well with some awareness given to allowing the heart to open as it feels comfortable. The recordings are very supportive for this so often just allowing the energies that you feel while listening initiate the process quite quickly. Deep breathing with intent to open and release tension through solar plexus, rib cage/chest area might add further support and you may want to ask your higher self for help with aligning to energy of Surrender as well if it feels right. If you feel any need for additional grounding through this, try to honor that. One of the main processes you were working was assisting in developing clearer connection to True Self, which is very cool, in part through letting go of any false selves or similar with which we might tend to express or display what seems most beneficial or needed rather than our own Truth. This process can bring up some discomfort so if any has come up in since session, that could be the source. You might notice increasing desire for communications at a heart level as a result and it felt as if that would be positive at the time. If you have no connections that are safe for that, I always promote support groups because of personal experience and in this day, many of us could find at least one we would fit in so that may be an option you could explore if needed. there is always so much information in these responses to unpack. I re read the response often in order to allow it to sink in and I am grateful for the guidance. I am fortunate to access a support group, I actually have a couple of groups at the moment that can support this, if I allow myself to open up! The few days after the session I was feeling my heart 'jumping' in my chest seemed a bit more than palpitations, which has settled now. And I will revisit the recording.